Enter the current (market) price of the bond. In other words, how much would you have to pay to purchase the bond today? Note that selling prices are typically listed in the "Bid Price" column of a bond table. This bid price is usually stated as a percentage of the bond's par value. For example, if a $1,000 par value bond has a bid price of "99.59", it means someone is willing to purchase it for $995.90 ($1,000 X .9959 = $995.90). When entering the current price into the yield to maturity calculator, please be sure to enter the full dollar amount and not the percentage. Enter the par value of the bond. The par value (face value) of the bond is the amount the issuer will return to the bond holder on the maturity date. Bonds are usually issued in par values of $1,000. Enter the coupon rate of the bond (without the percent sign). The coupon rate is the annual interest the bond pays. If a bond with a par value of $1,000 is paying you $80 per year, then the coupon rate would be 8% (80 ÷ 1000 = .08, or 8%). Enter the number of years remaining before the bond reaches its maturity date (whole number only). The maturity of a bond is the year the par or face value of the bond is returned to the bond holder. This is the effective annual rate of interest being paid by the bond issuer based on the purchase price of the bond and the amount of the annual coupon payments. This is the total YTM annualized rate of return on the bond if held until the maturity date. In addition to accounting for the interest rate being paid on the bond, this result also reflects the gain or loss resulting from the purchase price of the bond. Purchasing a bond at a discount (less than the par value) will serve to increase the annualized rate of return, whereas purchasing a bond at a premium (more than the par value) will serve to lower the annualized rate of return. Note that the calculator assumes you will reinvest the coupon payments as they are received. Based on the entered par value and coupon rate, this is the amount of the annual coupon payment. This is the total of all annual coupon payments between now and the maturity date. If the bond is selling at a discount (less than the face or par value), purchasing the bond will result in a capital gain at maturity. If the bond is selling at a premium (more than the face or par value), purchasing the bond will result in a loss of principal maturity. Based on your entries, this is the total of all coupon payments plus the principal gain or loss at redemption. In other words, this is the dollar amount earned over and above the principal invested. Using this calculator will help you to quickly compare the total return on bonds with different prices and coupon rates. If you don't know the answer to the questions, "What is yield to maturity? ", or "What are bonds and what makes them difficult to compare to one another? ", be sure to visit the Learn tab for the answers. Enter current price of the bond. Enter the par (face) value of the bond. Enter the bond's coupon rate percentage. Enter the number of years until the bond reaches maturity. 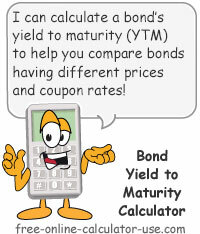 Click the "Calculate Yield to Maturity" button. This will display the information you will need to compare the entered bond with those that have different maturities, prices, and coupon rates. What YTM is, what bonds are, and what makes them difficult to compare to one another. In order to understand yield to maturity, it's important that you have a basic understanding of what bonds are, how they work, and how they are bought and sold. Basically, bonds are IOU's issued by a government entity or corporation, which promise to pay you interest on a sum of money borrowed from you -- along with the promise to repay the sum of money borrowed at the end of loan (referred to as the maturity date). When a government entity or corporation issues bonds (looking to borrow money), the bonds have a stated par value, a stated maturity date, and a stated coupon rate. The par value (also referred to as the "face value") is the amount the issuer (borrower) promises to pay at the end of the loan period. Typically bonds are issued with par values of $1,000 and can be purchased for close to their par value on the day they are issued. The maturity date is the date the issuer promises to pay the holder of the bond an amount equal to the par value. Bonds can have maturity dates that range anywhere from 1 day up to 30 years, or more. Generally, the longer out the maturity date, the higher the interest rate the bond will pay. That's because longer maturities expose the bond holder to more risk than bonds with shorter maturities. The coupon rate is the annual interest rate the issuer will pay on the amount borrowed. For example, if a bond has a par value of $1,000 and a coupon rate of 8%, then you will receive annual coupon (interest) payments of $80 (1000 X .08 = $80) until the bond's maturity date. Most bonds make coupon payments semi-annually, so you would likely receive a $40 coupon payment two times each year. What Makes Bond Yield Comparisons Difficult? What makes comparing bond yields difficult, is that bonds are often bought and sold in between their maturity dates -- with the prices of the bonds constantly changing due to changing interest rates and the demand for borrowing money. In other words, you could buy a newly issued $1,000 bond today at close to face value, but a month from now the bond might be selling for more or less than what you paid for it. Generally, if interest rates rise, the prices of bonds fall. And if interest rates fall, the prices of bonds rise. If you're not sure why prices and rates move in opposite directions, please visit the Bond Value Calculator Learn tab for a simple explanation. In any case, the important thing to realize is that bonds are rarely bought and sold at par value. This means that if you are looking to invest in bonds, you will likely be purchasing bonds at prices that are higher or lower than their par value. And it's this price-to-par-value variance that makes it difficult to compare yields on bonds with different maturities, prices and coupon rates. If you were to purchase a bond at a par value of $1,000 and held it until maturity, the yield would be roughly equal to the annual coupon rate. However, if you purchase a $1,000 bond for $900 (purchased at a discount) with a coupon rate of 6%, how would you know how the actual yield will compare to a $1,000 bond selling for $1,100 (purchased at a premium), but that has a coupon rate of 7%? Yield to maturity is a rather complex return on investment calculation that accounts for both coupon payments and the gain or loss of principal that occurs when bonds are purchased for less than or greater than the par value. But in your case, all you need to do is to enter 4 variables for each bond and the yield to maturity calculator will do all of the complex calculations for you. Please keep in mind that while the yield to maturity calculator can help you compare total returns on bonds, it cannot predict the future. Bonds, while considered to be safer than equities (stocks), do carry a risk that the issuer may default on the repayment. Of course, this risk is less when it comes to U.S. government bonds and Municipal bonds, and more when it comes to corporate bonds. And as with all types of investments, the greater the risk, the higher the expected return on investment.